Temple Street Chapel War Memorial board. Keighley's Temple Street Chapel originally had an oak board with the names of the fallen from that church. 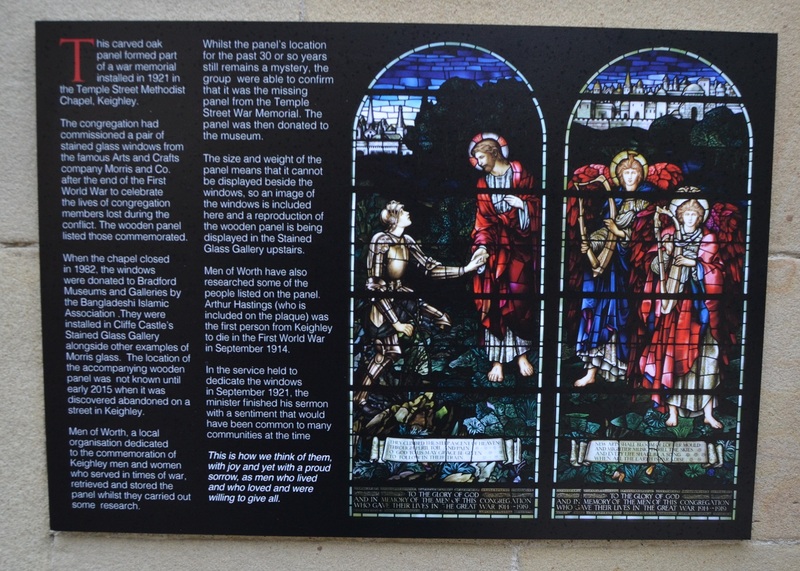 These men were also honoured by the church with two stained glass memorial windows in the West wall of the chapel. Temple Street Chapel held its last service in 1974 and was later sold in 1978, and the stained glass windows went to Keighley's Cliffe Castle Museum, where they were cleaned and restored and placed in a display of stained glass. They are beautiful and can be seen upstairs in the museum. 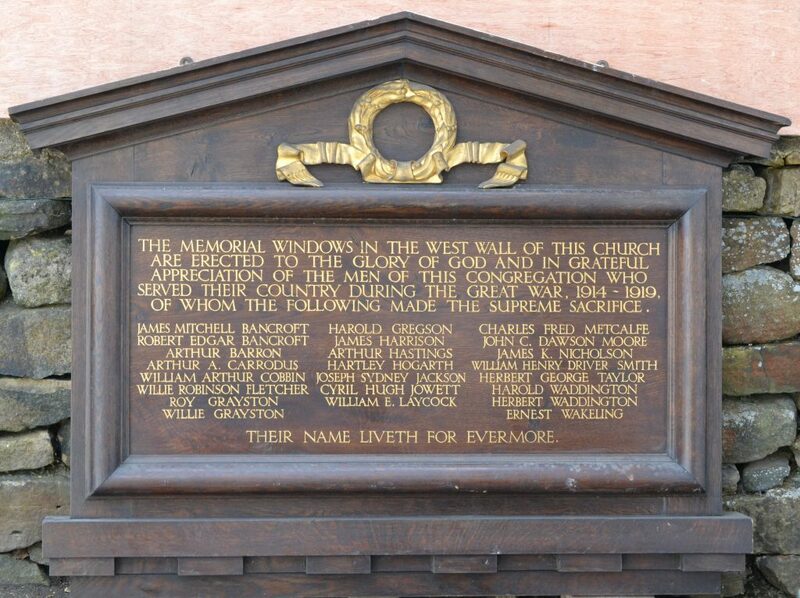 "TO THE GLORY OF GOD AND IN MEMORY OF THE MEN OF THIS CONGREGATION WHO GAVE THEIR LIVES IN THE GREAT WAR 1914 - 1919"
The chapel's oak war memorial board which held the names of these men was for years thought to have been lost, since nobody knew what had happened to it. 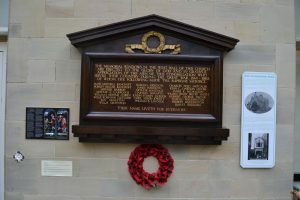 On 9th May 2012, local man Adrian Rodsett spotted a war memorial leaned up against a wall on Calton Street, Keighley, and he rang Mary Lister of Keighley British Legion, who in turn, rang us about it. After a search around the streets the memorial was located, and several local people were asked if they could shed any light on it's appearance. One man seemed to think it came from either number 9, or number 13, Calton Street, which were currently unoccupied and up for sale and one of these houses had recently been cleared of furniture, which had been left outside at the same time as the memorial appeared. 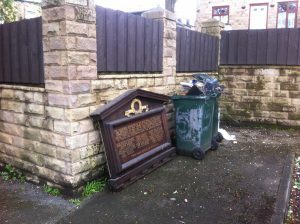 The furniture was collected later but he thought the memorial was left behind, leaned up against the wall and he didn't know who had moved it to its present position by the bins. Nobody else we asked had any knowledge of it and we found no other reason for it being left on the street. After these enquiries, the memorial was then brought home for safe keeping. THE MEMORIAL WINDOWS IN THE WEST WALL OF THIS CHURCH ARE ERECTED TO THE GLORY OF GOD AND IN GRATEFUL APPRECIATION OF THE MEN OF THIS CONGREGATION WHO SERVED THEIR COUNTRY DURING THE GREAT WAR, 1914 - 1919. OF WHOM THE FOLLOWING MADE THE SUPREME SACRIFICE. Armed with their advice, on 17th May we reported the memorial to West Yorkshire Police Lost Property Office. We also sent information to the Keighley News who ran an article about it's discovery and this also made a public statement in local media to advertise the fact that it had been found. After 28 days nobody had come forward, so on 1st July 2015 we made a successful claim for it and they gave us a West Yorkshire Police property slip, which meant we had proper legal ownership and we were able offer it to Cliffe Castle Museum. Their Collections Panel agreed to accept it on 10th August. 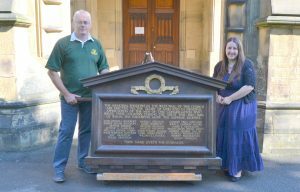 The memorial was delivered by us to Cliffe Castle Museum on 19th August 2015 and accepted by Heather Millard, Social History Curator. It was a bit of a struggle carrying it up the stairs to the workroom where they carry out conservation work on artefacts, but we managed and the memorial board and windows had finally been reunited in the same building! The final part of the story came when we were invited to Cliffe Castle Museum on 10th November 2015, to view the memorial in it's new position. Sadly, although they wanted to display it alongside the stained glass windows, it was too large to fit in the only space available. 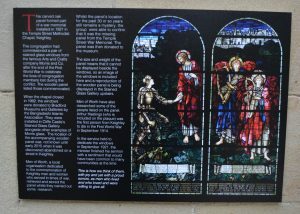 An excellent solution was reached by making a facsimile copy reduced in size and printed on a board to be displayed alongside the windows, and the original memorial was fixed to the wall in their conservatory room, along with an interpretation panel showing images of the stained glass windows. I was fascinated to read this story. I was born in London and lived with my parents and Grandparents together in a house in Clapham, London. My Grandfather Robert (Harry) Cobbin was born in Keighley in 1893. He was one of (I believe) 5 brothers and he often talked of his brother who died in the Great War. That person is William Arthur Cobbin who appears on the memorial. My Grandfather was invalided out of the army (Royal Welch) and then, following a period in Canada, settled in North Wales, where he married and had a son who he named Arthur after his lost brother. Thank you for saving this piece of history.